An abandoned freshwater turtle is recovering at Portsmouth’s Blue Reef Aquarium after being discovered on a beach near Fareham. The yellow-bellied slider turtle, which is only found in America, was spotted by a couple out on a walk along the beach. Initially the pair thought it was dead, but on closer inspection they noticed it was still moving and contacted staff at the aquarium for advice. Blue Reef have nicknamed the reptile Terry. It's thought he was a pet but got too big and was abandoned. “We received a phone call at the weekend from the couple who said they had gone out for a lunchtime walk and came across the turtle on the beach. “We advised them to wrap the turtle in a moist towel, put him in a bucket and bring him down to the aquarium so that we could examine him properly. “When he arrived one of our aquarists gave him a thorough health check and put him in to a holding tank in our quarantine area, where he will stay until he is fully recovered from his ordeal. “There are no obvious signs of injury and there is no way of knowing for how long he had been left on the beach, however if he hadn’t been discovered by the couple then he would almost certainly have died. “As a freshwater species he would not have survived in the seawater and a combination of cold, dehydration and the unwanted attentions of dogs and even seagulls would have proved fatal,” she added. The yellow-bellied slider is native to the south eastern United States. It is found in a variety of habitats, including slow-moving rivers, swamps, marshes, wetlands and ponds. The species is particularly popular as a pet and aquarists assume it was dumped by its owners. The lifespan of yellow-bellied sliders is over 30 years in the wild, and over 40 years in captivity. 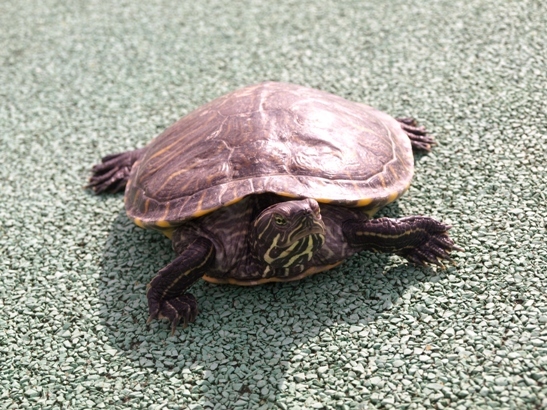 “Unfortunately turtles and terrapins are one of the most common pets that get abandoned by their owners,” said Jenna. “People aren’t prepared for how big they grow and also for how long they can live. However there can be no excuse for just abandoning them to their fate,” she added.